So I skipped Yoga yesterday afternoon ... wasn't in the mood for a fourth consecutive day, I am not that motivated. But I think I'll try going on Friday again :) So I went shopping with my newly free afternoon time, bad idea. Well, I got plenty done. I got my travel insurance and new fancy shampoo ... and then I saw Exclusive Books was having a sale (here's where things turn). Naturally I bought two books, at least it was under a hundred bucks tho. But still, it pushes my un-read book total up to six (not including book club books!). I really must stop buying! And then there was more general shopping at Woolies & PnP. But still, it adds up. Varen came over a little later and I whipped up some dinner and then we headed off to see Shrek 3. Who’s ready for thirds? Being king isn't for everyone – especially if you're an ornery ogre who smells like the shallow end of a swamp. When Shrek married Fiona, the last thing he wanted was to rule Far Far Away, but when his father-in-law, King Harold, suddenly croaks, Shrek is quickly fitted for the crown. Now, unless the reluctant would-be king can find a suitable replacement, he'll be royally screwed for the rest of his days. As if Shrek didn't have enough on his plate, Princess Fiona has another little surprise on the way. Reeling from the duties of running a kingdom and impending fatherhood, Shrek sets off on a quest to find the only other possible heir to the throne, Fiona's long-lost cousin Artie, a medieval high school outcast. While the ogre is away, his old nemesis Prince Charming rears his handsome head and returns to the kingdom of Far Far Away with redemption on his shallow little mind. 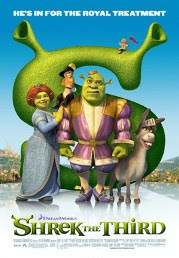 Even with Donkey and the ever-so-suave Puss In Boots by their side, it's going to take an ogre-sized effort – and a whole lot of help from Fiona and her band of princesses – for Shrek and Artie to save the day and find their own "Happily Ever Afters." It was okay. Not nearly as good as the first two tho, which was a little disappointing because I had high hopes for it. My favourites were the baby Dragon-Donkey's ... too cute! I also owe you another review. 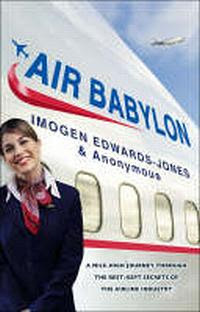 This week I finished reading (finally, since I'm just not finding the time anymore) Air Babylon by Imogen Edward-Jones. I quite enjoyed this book, although it does make me a touch more nervous when I think about flying next time around ... now knowing what's most likely going on behind the scenes! Definitely entertaining!